Problem Children Seem to be Coming from Another World? Caution! Not for the weak minded. This Novel has a pretty complicated plot. A reference from Myth, Fairytale, Legends, History, and Religion are all mixed up together in this novel. The plot of this Novel perhaps is the most complicated one in my reading list. Although the story is complicated, overall it's enjoyable. The plot is decent and the character is likeable. I recommend this novel for someone who want to try something that a little bit heavier but still enjoyable to read. Is this the most awesome Novel out there? Probably not. Is this an amazing novel that everyone should read? Still, probably not. Is this novel worth spending time reading? In my opinion, yes. Is this, over all, a good novel? Again, in my opinion, yes. The characters are enjoyable. Their interactions are amusing and entertaining. Most importantly, they all have personality and aren't some cheap knock-offs that can be forgotten with ease. The setting is unique, the concept is not. The plot is nice and, in my honest opinion, also unique. Instead of the series being, "Sent to another world, beat up bad guys, become a hero, so on and so forth." It is more along the lines of, "Restore the tarnished and ravaged community to its former glory." Similar? You could argue that, but that is not the entirety of the plot. I won't say any further than that as it will spoil the other enjoyable parts. Unfortunately, this series has a lot of action which can make it feel simple and possibly a little bit droll. and is arguably one of the stronger "known" characters. But he definitely doesn't beat those who should be stronger than him with 'willpower', 'determination', 'heart', or anything of the likes. The same goes for most/all the other characters as well unless there is a pre-determined reason, which is a nice surprise and shows the strengths of the authors writing. One of the more impressive, and greatly enjoyable, parts of this story is that : It doesn't get side-tracked. The side-plots, or the characters choices, ultimately fits together bits and pieces that further the main plot. While it might not seem entirely apparent at that time, later down the line you will possibly notice those actions or events come back as a basis for future choices. Again, Dues Ex Machina rarely occurs, and when used, it is used appropriately. Yeah. This is actually a pretty good novel, I'd give it around a 3.5, it's better than average. It's amusing and somewhat interesting, it's surely worth your time to read, I for one really enjoyed it a lot. However, there are some fatal flaws that bring down this novel from a rating of 4 or 4.5, I find it amazing how people keep giving it 5 stars all the time, so I'm going to mention a few flaws instead of going on about how glorious it is like everyone else.... more>> All this might sound like I'm just whining, but there's a lot of good things about this novel too, I just felt like it was unnecessary to mention it since it'd be nothing new and a few things I really disliked should be mentioned for future readers. First of all, there's a tad bit too many perspectives, which often makes you wonder "is there even a main character in this novel or is there several protagonists?". Well, that's just something I personally didn't like too much (how can I get immersed well into a novel if several main characters are running around since I'm one of those people that imagine myself from the MCs perspective), it's not that much of a big deal since it's written well nonetheless. The second problem is serious amounts of redundant information. Trivia and "facts" (these things are often wrong too, distorted to fit the plot), usually about stuff like history, mythology, stars, fairy tales etc. Often it feels like instead of reading a fantasy novel, I'm reading a history or mythology book... Most of this crap is unnecessary to know and you'll be perfectly fine if you just skip a majority of it, it's just there to fill out space with copy-pasted and sometimes slightly altered information from the internet. It's kind of like reading chinese xianxia novel if you compare the banters of the peanut gallery (about how powerful or weak someone is) or the text about how beautiful someone is, how foolish someone is amongst other things with distorted mythology, history and fairy tales. Both has the issue with overly redundant text that says nothing important except that the author tried to lengthen the novel. Not saying all this information is unnecessary, but a lot of it is. It's quite honestly a pain to read as it is terribly boring, especially since you know that you can't trust that what is written is true. The third issue is the power levels. They're all over the place, the entire power system is quite horrible. Nothing feels stable at all. Instead of stuff like cultivation, levels or anything else that feels permanent, this novel barely has anything that let's you progressively increase your strength. It's all about gifts, nothing else seems to matter. These gifts can be lost all of a sudden or gained, usually through games. So they can't really get stronger on their own without blessings and if they're unlucky, they will all of a sudden lose all of their power. A weak fool can become super strong in but a few seconds if granted "divinity" and all the same someone strong can become weak instantly if you take it away. Every power just feels borrowed and temporary. If someone with similar gifts show up, bam, you're about equal in strength. Characters told about in legends can become extremely weak due to losing a gift. It's just ridiculous. The value of power in this novel is the most worthless case I've ever seen. What's the point of power if it's not really yours or something that was given but can't be easily taken away or received? If it's all about a gift that can be taken away instantly if you lose a bet? The MC could thrash an opponent completely only for the enemies to get divinity and then be on par with him after just a few hours or maybe in the middle of a battle. It's not a good or interesting system, it's mainly vexing. There's also way too many people that are equal to the MC in power, seeing as how he's extremely OP from the very start, it's one of those novels where the MC should be the strongest or at least become the strongest towards the end, but he gets beaten silly by the last boss and several characters before has been equal or a bit superior to him in strength even though they're just random characters (often he will duel with those guys and then get to a draw and never fight them again to determine who's the most powerful). Powers doesn't really develop that much, he doesn't really get much stronger from the beginning to the end, he mainly learns a few tricks and how to use his power a bit. All in all, it's not a novel I could enjoy if I care about the battles or powers of the characters. Power levels and battles are NOT enjoyable in this novel, it's mainly a "You hit me, I hit you, I throw this at you, you throw this at me, I used some weird power, you died"... Nothing complicated, interesting or well done about it. It's as if they're kids throwing falcon punches at people, it's quite dull. It's by far not the worst I've seen, but it's absolutely not that good. Then the fourth thing which bothers me the most, romance. This is a real joy killer. It's as if the author has some kind of grudge or trauma against romance that makes any romantic development futile. There's great girls all over the place and there's a few hints that izayoi and kuro usagi have some romantic attraction to each other, although neither seems to realize it, but the closest thing we have to real romance might be the calico cat and the cat girl that was entwining tails or something, probably a date... Don't expect any romance if you read this, you're going to get disappointed if you do. How the tag "Strong love interests" came about is beyond me. None of the girls or izayoi seem to have any real feelings of love towards anyone. It's as if they're all impotent. At most we're seeing some light s*xual harassment and teasing. It disappointed me to no end. It's really as if the people, especially the teens that should be in an age where they're really interested in the opposite s*x, is completely impotent and incapable of love. Throughout many life or death battles and experiences, no romance has started. It feels like it's quite impossible. I mean, I don't mind if there's no truly romantic scenes or change in characters due to two characters becoming lovers/girlfriend-boyfriend. I just want to know that these two are interested in each other and have a relationship or will have a relationship. Everything could still be the same, attitude, personality, acts, but we'd know that they're actually together. Some might think I'm being ridiculous, but for me it's a very important thing that, in a novel like this with a lot of great girls and one MC, that at least one of them get together. Hell, if there was only one male and one female, I'd still think it's extremely important... It makes it possible to relate to them more and feel like it's more realistic, it gives an entirely different depth to the whole story and characters just by confirming that there's such a relationship... 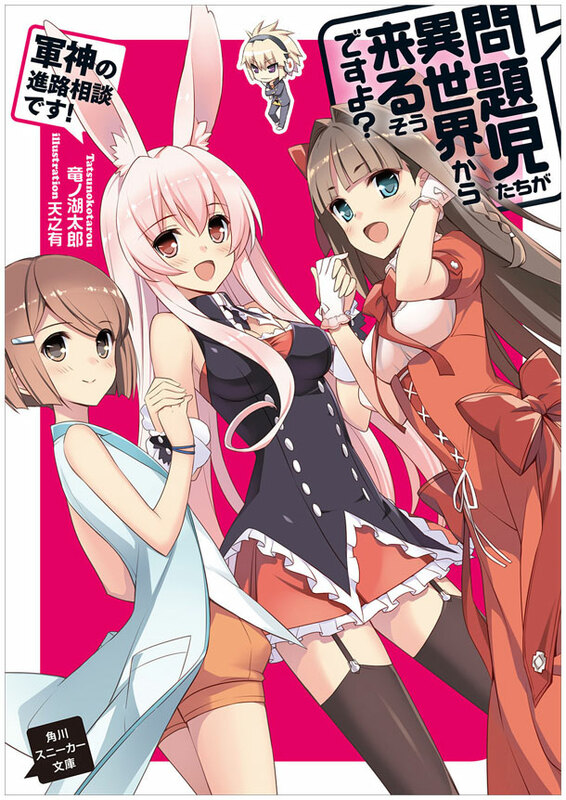 Some novels are written in a way that makes romance unnecessary or actually reducing the value of the story, where there's good reasons for there being no romance, but this isn't one of them, stuff like that should've been a given from the very start when 3 girls great girls and 1 guy was introduced, all in their teens except for the rabbit. It's a good read. Decently made novel with good plot but easy to guess plot twist. The main characters were polished and well made. Still have trouble with plot armor and plot hole but that's acceptable. The real bad thing is the fights at the end when it focused mainly on plot and backstage setting and not the fights themselves, it will be hard getting through that since it lasted for 3 volumes. Anyway 4.5/5 for this one. Decent read. Would not recommend to those who dislike simple plot lines and characters. Every single thing in this novel is very very well thought. I means really well thought! Almost all the things happening here and there have reasons for them to happen and those reasons are explained which is very rare for any author to do. This novel basis is Gift Games - Something which Gods created inorder to counter Demon Lords and keep powers in check as well as way for Humans to rise. Yes, MC is Overpowered. It's to the extent that his Gift (you can consider it to be his... more>> power) called UNKNOWN. That is to say even Gods can't determine just what power it is! He is overpowered but his enemies are more overpowered so it doesn't make you turn away from him because of it being just cliche or plot armor stuff. Yes, it has plot armor in story ending was done with a plot armor which MC finds very regretful. MC knows his pros and cons and he uses his brains more than his uses his brawns which makes him kind of unique? At least he is the only one of MCs I know who uses his head more than his fists. This novel has lots of vague sentences and questions floating around so if you can't catch them you won't just understand what's going on and how the f**k MC defeat the guy and just wtf is happening so keep that in mind. Every sentence has meaning. You can consider this whole series of mondaiji to be just one arc. It's a huge foreshadowing done for the next arc which is Last Embryo. This has tons of mysteries floating around and they're very very fun when they gets solved or we are told about pasts or future courses to be taken from them. It's not blindly running here and there or somebody telling you to go there. They figure out themselves which is a big thing coz it just don't happen coz of luck! There is reason for that to happen. Overall I would highly recommend this novel to everyone looking for mysteries with tons of action. This novel is hugely based on Myths, Legends, Religions, Fictions, and real life events so reading this equals to learning a lot about what happens all around you or how those people do think. My only regret is lack of romance in this novel even though it feels there are a lot of girls with potential to be main heroine. It just doesn't happen! Enjoyable. Not exactly masterpiece material, but if what you're looking for is a novel that is decent enough to sink your time into, then this is it. Behind all the convoluted mumbo jumbo regarding different mythologies, scientific theories, east/west mysticism, and pseudo-scientific bull, the series is basically a coming-of-age story of 3 children. And a good coming-of-age is defined by its characters. MC 1, a.k.a self-insert Gary Stu. The hook of the story. I admit it was fun reading this guy's antics, albeit his one-dimensional character. Fret not though, he did grow... more>> up in the middle of series, but not as much as the other two. But to be honest, the guy's still flat as water by the end of the tale, even with his "character development", if it can be called that. MC 2, a.k.a another one of them domineering ojou-samas. No, not MC 1's love interest. In fact, there's none of that pointless love-triangle shtick prevalent in LNs of this genre. Hurrah! Going back to MC 2, she's the one with the 2nd best character development among the 3 MCs. She also shows more "humanity" compared to our Gary Stu, but even rocks have more personality against Gary Stus, so whatever. Can't relate to her at all, unless you're a person who lives under the pressure and burdens of society (school, work, etc). Which I guess is everybody. I guess I can't cause I'm a NEET. MC 3, a.k.a the obligatory kuudere. With no emotions comes OP powers. Perhaps her power pales in comparison to MC 1, but make no mistake, the power to influence evolution is broken. This makes her one of the rare OP characters that can actually be called a "character". Pity she's overshadowed by MC 1, but everybody is overshadowed by MC 1, cause he's a Gary Stu. Nonetheless, she's the one with the best backstory, best motivations, and best character growth in the story. 'nuff said, lest it goes to spoiler territory. As for secondary characters... they're okay. Perhaps the most dazzling of them would be the Ochibi-sama kid. He actually has more character development than any of the three. I feel he should get MC status instead. And if you're one of them people who like harems, well, he's your self-insert. The rest get decent screentime and character development, and are not just relegated to NPCs or one-off characters. Good job author for giving your secondary characters more personality than MC 1. Character interactions and conversations are well-written, actually. The talks are pretty consistent with their individual quirks and personalities, and as the series marches on, you see maturity show up in their interactions. It's much more obvious in the latter volumes, but if you know what you're looking for, you'll see character growth in their conversations with each other. As for plot, with it being buried under piles of references that are twisted to suit the needs of the story, prepare yourself for a lot of explanations. Some people might claim this makes it an intellectual read, but these references provide nothing whatsoever outside of the the current game or situation. Well, maybe there is the occasional reference that set-ups the next arc of the story or will be mentioned later in the story, but more often than not, the references are one-trick ponies and will never influence the flow of the story. The cause and effect of events are pretty decent, however. One event causes a chain reaction that finally leads to the "final battle" in the latter volumes of the series, and I must admit, most of the time, I never felt that the events that lead to the ultimatum were forced or were too convenient. Kinda balances out the convoluted references. Overall, I can say that the plot is a pretentious mediocrity, but is easy to follow and quite enjoyable to read. And hey, it's a coming-of-age story, it's all about the characters and character interaction anyway. This novel is able to mix various genres without making it uncomfortable. And even though the male protagonist is strong beyond belief and can defeat anyone with 1 hit, you came to like him because of his personality. As for the female cast, each of them has unique powers and personalities that makes things interesting; especially Kuro Usagi (Bunny Girl and Main Heroine) since teasing her is way too much fun. This light novel is totally awesome. It may be little hard for some people to understand, because it have many things related to some old legends. But once you get into it you're gonna totally love it. One of the first novels, I ever read, so I really enjoyed it. Has flaws but is a great novel. Starts out with a comedic undertone but picks up the plot really fast. All the characters are thought out and beautifully presented before the reader with an enjoyable plot.